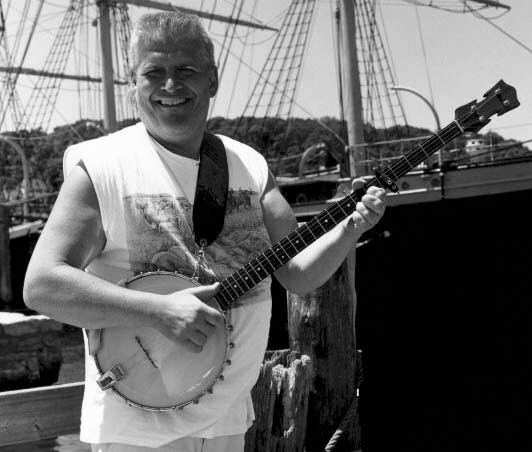 Don Sineti , folksinger, songwriter, part-time sea chanteyman at historic Mystic Seaport Museum (with one of the most powerful voices on the Eastern Seaboard! ), and long-neck, 5-string banjo picker, is also an award-winning marine mammal illustrator with a number of prestigious exhibitions and books to his credit. For over twenty years, he has combined his exhaustive knowledge of cetaceans (whales, dolphins, and porpoises) with his boundless energy, to deliver rousing renditions of songs from the days of wooden ships and iron men, alongside his own compositions dedicated to saving whales and the degraded marine environment. With a booming voice and a hearty laugh, he shares his music, his art, and his unrestrained love for the whale with audiences of all ages. of his music is rooted in the British Isles, Canada, and the United States. majestic giants of the deep. His music is an integral part of the program. note-cards and other items. Custom commissioned works are also possible. workshops or school assemblies. Extended residencies are also possible. Don served as a consultant for the 20th Century Fox movie "Master And Commander, The Far Side Of The World". They requested his input on the traditional sea songs used in the film. He said it was great fun, and he got a "thanks" on the C.D. or by phone at (860) 242-1135.